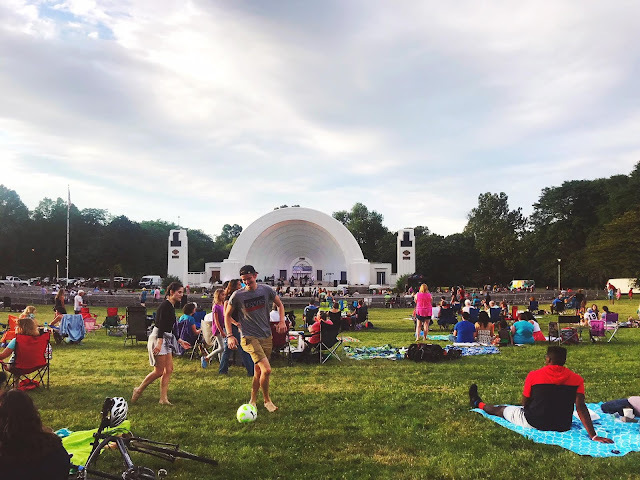 Spending an evening at Washington Park Wednesdays has earned a spot on my Milwaukee summer bucket list nearly every year for the past several, and 2018 was no exception. It all started with my dear friend and coworker at the time, Jane, who is one of the brilliant folks running the show at the Shell. Here she is — the people's queen! It's been fun to watch this once-small summer music series grow. While the turnout was rather sparse in its early days, the hill overlooking the Shell is now plenty hoppin' with a crowd that's beautifully diverse. 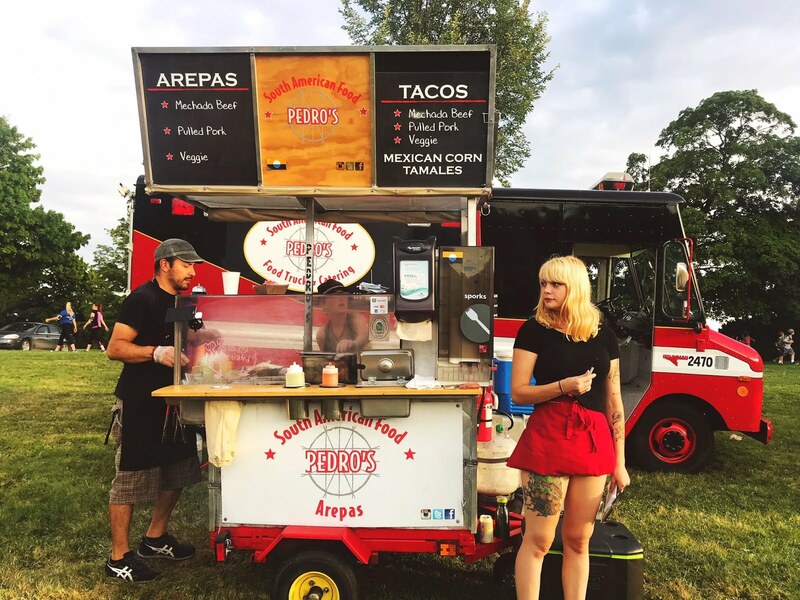 The lineup of food offerings has also grown, boasting the likes of Pete's Pops, Pedro's South American Food, Press Waffles, and more. It's becoming a challenge to pick a delicious poison. During my most recent spin at the Shell, I went for the pork arepas from Pedro's. Holy mackerel. Good luck tearing me away from Pedro's if this food truck is ever on the premises. 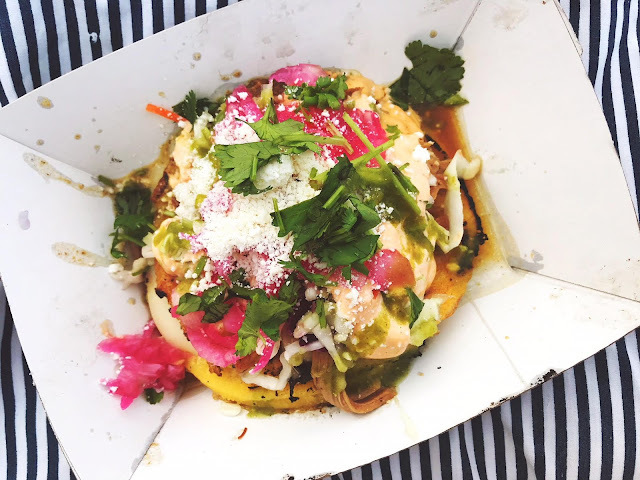 Arepas for dummies (like yours truly): They're kinda like a corn cake patty stuffed with melted cheese, heaped with toppings and slathered in sauce. Get in mah belly! Did I save room for a Press waffle with Nutella? Why, yes. Yes I did. The music that night was latin, with a troupe of local samba dancers taking the stage between acts. Still coming up this season are the likes of No No Yeah Okay, Collections of Colonies of Bees, B-Free celebrating the music of Prince, the Extra Crispy Brass Band, and more. People start to gather in the park around 5pm, and music kicks off around 6:00. So put Washington Park Wednesdays on your summer bucket list, friends — it's earned a spot! Sometimes, no matter how you fight your fears of being basic or tell yourself "I could make this at home," you still succumb to the avocado toast. Compared to piles of syrupy pancakes or benedicts drenched in sauce, avocado toast often feels like the lightest choice on the menu, and that's what keeps me coming back. Here are three Milwaukee toasts I've tried in recent history. The favorite? It surprised me, too. In Third Place, The Plaza Hotel. Here we have something that's lovely to look at, but lacked a je ne sais quoi. To be honest, I thought the avocado tasted a bit like the guac you get at Metro Market: fresh enough, but like it's been sitting out too long. The whole thing just didn't do it for me. And at $12, it really should do something more than look pretty in a picture. Second Place is really more like Tied-for-First, but I digress. Fuel Café on 5th Street has scrumptious food all around, and their avocado toast in no exception. Theirs is topped with tomato, whipped dill cream cheese (! ), and served with a house salad. Delicious. This is $9 I'd spend again in a heartbeat. I've gotta give First Place to what I thought would be the dark horse in this race: Urban Beets Café. 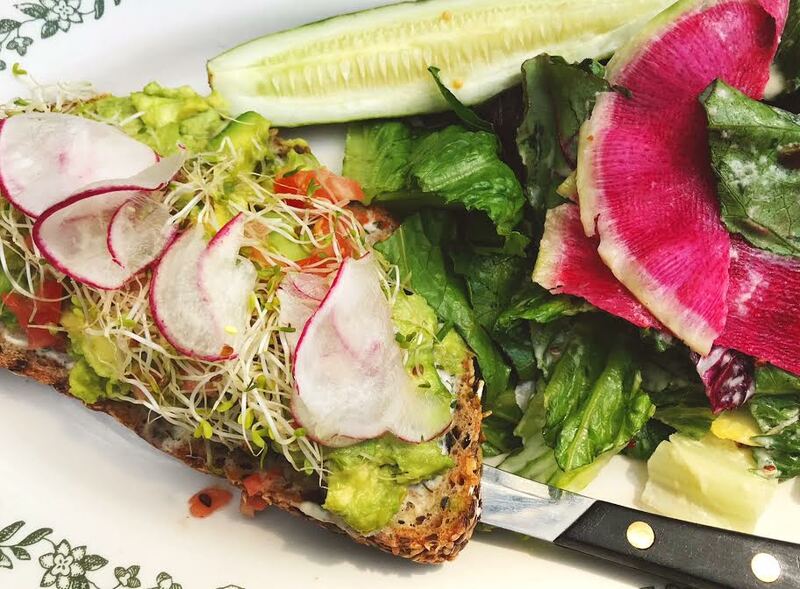 Urban Beets is a plant-based eatery, and they top their toast with coconut bacon. Say what!? 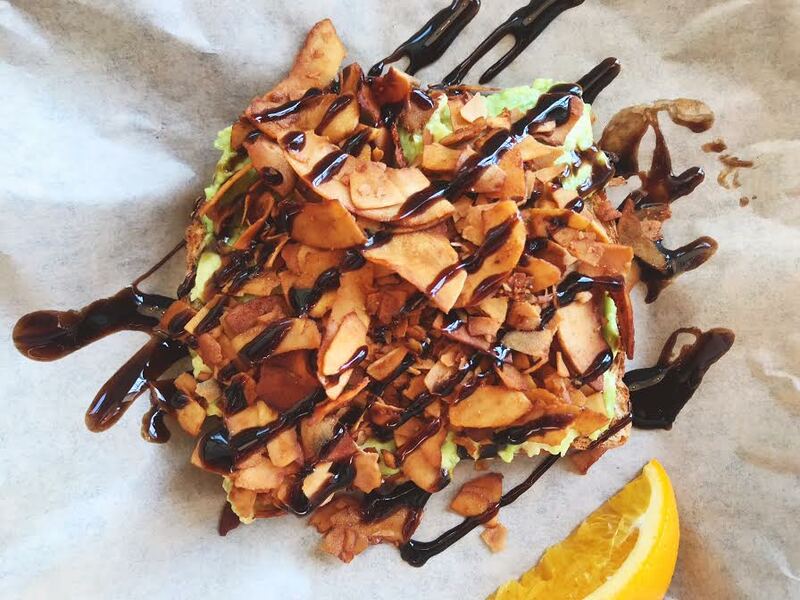 Yes, their fresh avocado is topped with crunchy bits of toasted coconut prepared smoky-style, and those bits are then drizzled with plenty of finger-lickin' balsamic. It makes me do a happy dance. The best part? You can get just one toast, perfect for a small breakfast, for $3.95. Love. 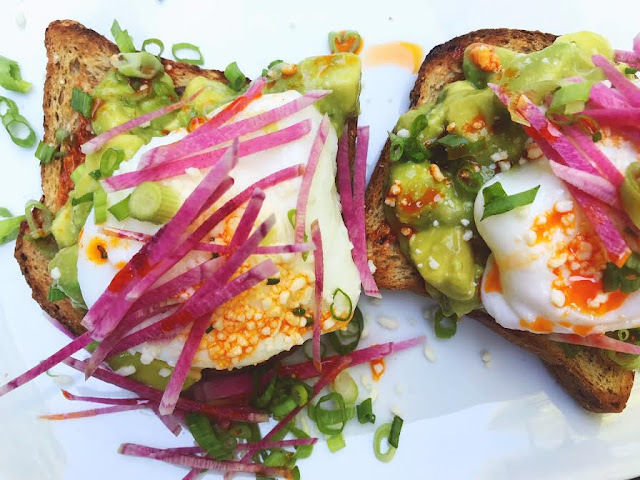 If anyone has had an avocado toast that could rival these babies, sound off in the comments! Let's all be basic together. The Milwaukee Rep presents "Lost Girl"
This World Premiere event isn't the Peter Pan narrative you'd expect. There's no pixie dust, Neverland, or mermaids. The only magic found on stage — and it's a powerful magic at that — comes from the remarkable cast of teens performing playwright Kimberly Belflower's simultaneously authentic and lyrical new script. Belflower sums up her inspiration in her playwright's note: "The term 'Peter Pan Syndrome' is a familiar one, referring to boys who never grow up. But when I was twenty, a friend told me I had 'Wendy Darling Syndrome,' which I had never heard of. 'Because you're always trying to save little lost boys,' she said." At the core of Lost Girl is Wendy's deeply emotional struggle to move on from the boy she first loved — the boy who told her to wait for him, that he'd come back, then never did. The process of letting go of a relationship, in one manner or another, is something we all can relate to. In the play, Wendy is content to be sad, allowing herself just eight minutes each day to fixate on Peter. For our heroine, letting go of sadness means letting go of memories — memories that keep her first love alive. Memory is a pivotal theme throughout Lost Girl. Belflower says, "In Neverland, the land of forgetting, Wendy was tasked with remembering. She remembered all the things boys didn't have time for: bedtime stories, taking medicine." This points to the emotional labor many women take on in their relationships. Reese Parish, a junior at Nicolet High School who so fully and phenomenally brings Wendy to life in this production, made a very wise observation during Thursday's post-show Talk Back: "Women give more of themselves in relationships than we mean to." In the world of Lost Girl, this giving manifests in the depth of Wendy's memories. She can recall all kinds of details from her first encounter with Peter and her time spent in Neverland, yet she doesn't remember the wallpaper in her childhood nursery. Peter, on the other hand, remembers the wallpaper and little else. The way in which details as small as wallpaper are woven throughout Lost Girl shows the artistry of Belflower's script. The dialogue feels real and unforced, with moments of laugh-aloud humor and even more moments of tenderness and fire. And yet there are these incredibly poetic and repetitious interludes, like a Greek chorus echoing both the thoughts of the Other and those inside Wendy's own head. On more than one occasion, the characters in Lost Girl muse "that's a pretty thought." There are indeed pretty thoughts aplenty. 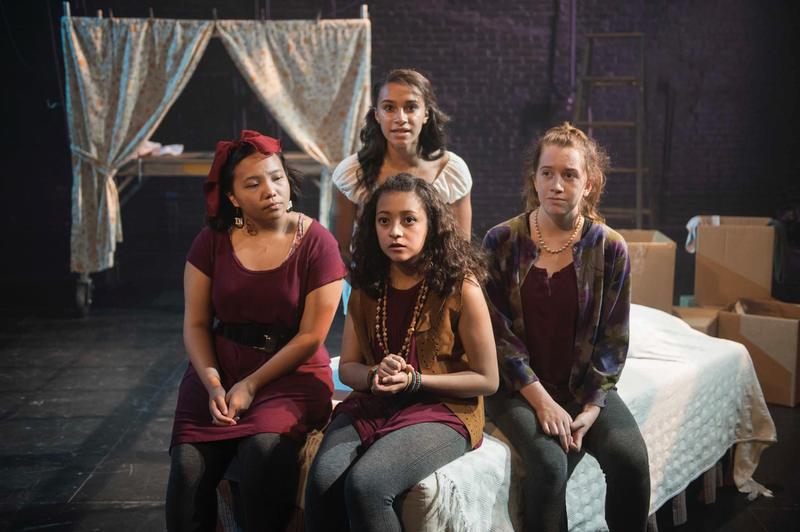 Those thoughts, both pretty and raw, are brought to life by the tremendously gifted group of teens from the Rep's Professional Training Institute (PTI). 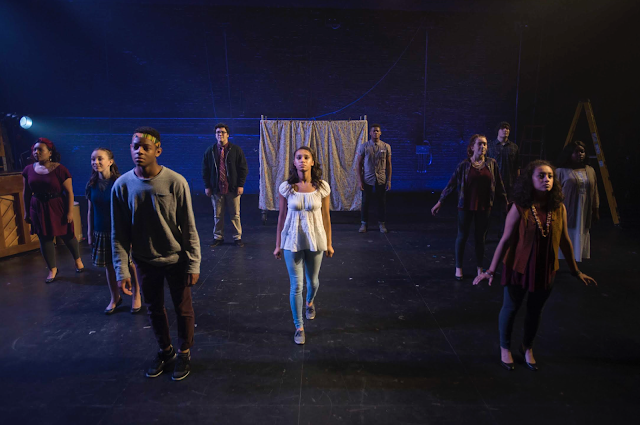 The Institute is a free, year-long advanced actor training program for students in grades 9–12 who may have an interest in pursuing a career as a professional artist. What a joy to see this troupe of young people originate these roles! Their genuine connection and camaraderie is evident, and not once did they fumble. They do their "professional" title proud. Belflower says these are the people she's writing for: people in the in-between. Between childhood and adulthood, that is. "I write for and about young people because there is so much life in-between," she says in her playwright's note. "Because of those feelings. Because of that search for light. Because the things we experience at that age are real, and they matter." In their Talk Back, the PTI cast laid bare their overwhelming gratitude for Belflower, for putting pen to paper and letting their in-between voices be heard. 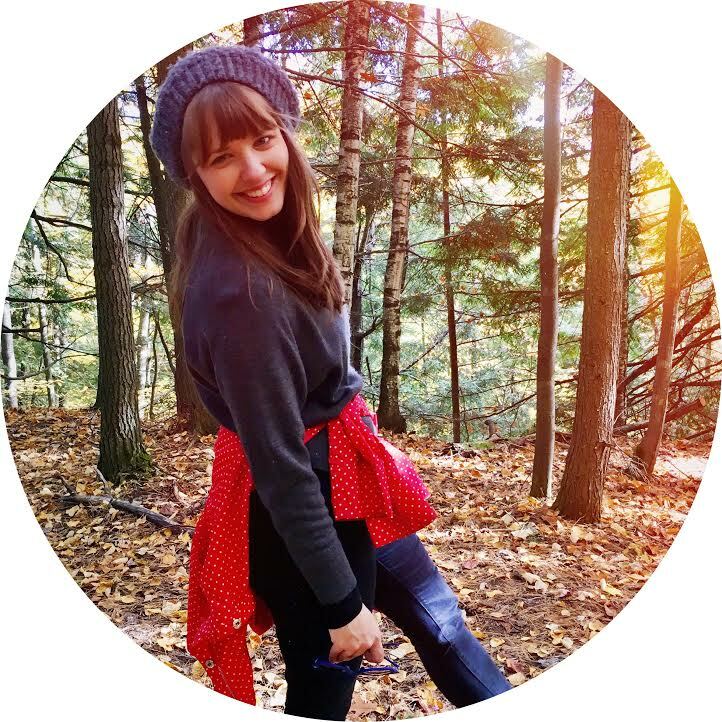 Lost Girl speaks to the things they, as teens, are currently going through. "We're all a little Wendy," one said. The story of Peter Pan is so enduring, beloved, and adapted because it's easy to find commonality and connection in its themes — the preciousness of youth and fear of growing up. Lost Girl draws the audience in through this story we've heard a dozen times before, then winds up bringing the high-flying fantasy back to solid ground. It's refreshing, bold, and brave to take such iconic characters into a new and very real place, teeming with the big, wild emotions of adolescence. Lost Girl reminds us that, as Peter says, "everything matters." The love, the loss, the way in which we grieve, and the time it takes to heal and grow. It matters whether you're sixteen or sixty. "You can't get back what you give," Belflower writes. "But you can keep giving." Lost Girl certainly gives with its whole heart. Top photo from left to right: Mainyia Xiong, Meguire Hennes, Durran Goodwin Jr, Logan Muñoz, Reese Parish, Kenyon Terrell, Maricella Kessenich, Juliana Garcia-Malacara, Saleaqua Winston, and Dominic Schiro. Bottom photo from left to right: Mainyia Xiong, Juliana Garcia-Malacara, Reese Parish and Maricella Kessenich. I've written about my jaunts to Milwaukee's Bastille Days on more than one occasion. Last year I praised the addition of Press Waffles, a repeat vendor in 2018, and the classic beignets. In 2014 (mon dieu! ), turns out I had the same sentiments as this year regarding the over-the-top crèpes. To quote yours truly circa 2014: "I just wish the Bastille Days crêpe people would practice 'less is more.' Keep your mousse and your cream; give me a Nutella-filled triangle." I will say that my yearly beignets didn't disappoint, though — crazy lady coming through — I could have used a little more powdered sugar. A new favorite: the pain au chocolat (chocolate croissant) from Le Rêve. And one final food note: The served-hot baguette from Lake Park Bistro was cute at first, then a let down once it cooled off. Not a let down? The music. 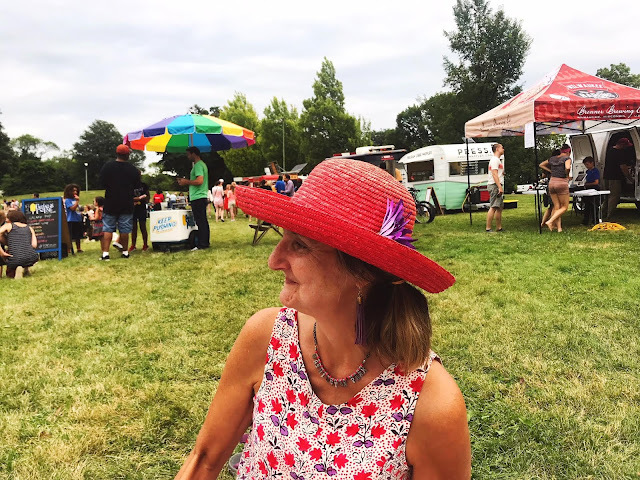 For me, this year at Bastille Days turned out to be less about the eats and more about the tunes. I enjoyed more than one performance by festival favorite Robin Pluer, who has been gracing the 37-year-old Bastille Days with her presence for an unbelievable 20+ years. She brings a bit of Edith Piaf to the fête. On Thursday night, I was transfixed by the electric magic of Ginkgoa, an electro-swing pop group that's half Paris, half New York. Their lead singer is a fierce New Yorker who rocks sequined showgirl shorts and killer shoes that occasionally break out the Charleston. Her Parisian counterpart and lead guitarist hyped up the crowd and got Milwaukee groovin'. Oh, and two words: clarinet solo! They're like 1920s hot club jazz with a French techno twist, and the crowd on Thursday night was on their feet in no time. On Friday night, it was Sweet Crude that entranced. Again we have a lead guy and gal heading up a talented ensemble — a guy who sings and fiddles, a gal whose insane vocals demand you stop and listen. And they do it all in both English and French! With a horn section! What little I caught of their set left me wanting more. Bottom line, if you're a fellow francophile, it's likely you'll also get into the kind of musical acts on display at Bastille Days. You might say it exhibits a bit more culture than some of our larger lakefront fests, and that's très cool.